Yeah dude that’s cool keep it up. You’re the most sensible I have read so far —Quite interesting blogs — Very knowledgeable and prudent. Other Christian (?) blogs offers their own way of biblical understandings and explanations but your blog contains the most explained about religious issues and controversies after all, you’ve based all your explanations on the bible — Quite good huh. May I suggest that you create a biblical forum consist of leaders of other religious denominations like your old program in the Philippine radio (This is Manolo and his Genius Family Special ) may I suggest a name FORA BIBLICA. (I just construct it from a health program I used to watch FORA MEDICA) hope to read your future blogs and I would like to commend you for doing a job very well done. Your reply to my blog entitled “The Power that Drives Me” caught my attention while I was very busy preparing for a “Bible Exposition” in Northern Luzon, Philippines.I am a very busy person; Sometimes, not physically, but mentally. (Romans 7:25)I thank God through Jesus Christ our Lord. So then with the mind I myself serve the law of God; but with the flesh the law of sin. If I am not the first person whose mind is very busy, but I can certainly feel I am not the last.The Apostle Paul experienced the same thing. (Philippians 2:20)For I have no man likeminded, who will naturally care for your state. Thinking of what to teach to our congregation and those outside definitely does not tire me.I believe in the promise of the Lord that He will give the teachings in the perfect time it is needed by His people. (Luke 21:13-15)And it shall turn to you for a testimony.Settleit therefore in your hearts,not to meditate before what ye shall answer:For I will give you a mouth and wisdom,which all your adversaries shall not be able to gainsay nor resist. Irrefutable teachings from the Bible come to my mind very easily.I believe it is God’s working that reveals His truth into my mind even if I am not thinking of it.These are revelations meant by God for His people. I do not just say this, but this was experienced by thousands upon thousands of people who come to our “Bible Expositions” asking all kinds of questions, being answered directly from the verses of the Bible. Brother Eli Soriano in one of his ‘Bible Exposition’ where he answers people’s questions regarding salvation taking it directly from the Bible. Although I am presently very busy, I welcome your suggestion with an open mind and heart; if there will be a forum of religious preachers and leaders, who will come together in order to discuss issues regarding faith and religion.Please register my name in that forum at once.If you want to spearhead such a forum, you have all my backing (of course, mine is very little; but the backing of the Bible means everything). (Isaiah 43:9)Let all the nations be gathered together, and let the people be assembled: who among them can declare this, and show us former things? let them bring forth their witnesses, that they may be justified: or let them hear, and say,It is truth. The gathering of people of all nations may not be physically possible now; but I believe it is very much possible through the internet.We can, by this technology, make up a ‘biblical fora’ in search for anybody with witnesses to present, if what he is declaring are God’s former things and the TRUTH. I believe the internet is now the most civilized way of arguing with people wherein there is no chance of anybody being harmed by the hotheaded and the hypocrites claiming that they are of God. (Titus 1:16)They profess that they know God; but in works they deny him, being abominable, and disobedient, and unto every good work reprobate. Just very recently, a discussion between two groups who both claim that they are the only people of God (but I believe they are both of satan) clashed violently against each other (see reference below).In the internet, this will not happen. One of our ministers experienced the same thing with these people; but our group did not go down to their level (see video below). God wants us to reason out together to see the real and the whole picture of the truth, but without violence. (Isaiah 1:18)Come now, and let us reason together, saith the LORD: though your sins be as scarlet, they shall be as white as snow; though they be red like crimson, they shall be as wool. To reason out together in the intent of knowing the truth and finding atonement for sins is something Godly.Discussions that ends up violently harming people, especially the innocent, is satanic. …Ye are ofyour father the devil,and the lusts of your father ye will do.He was a murderer from the beginning,and abode not in the truth,because there is no truth in him.When he speaketh a lie,he speaketh of his own:for he is a liar,and the father of it. Christ said this when the Jews tried to kill Him during one of His argumentations against them. To argue and to reason out with people in search for the ‘Divine Truth’ regarding salvation is a Godly intent in the heart of a true preacher of God. …And he spake boldly in the name of the Lord Jesus, and disputed against the Grecians: but they went about to slay him. Even the Supreme Court of the Philippines has upheld in its doctrines and jurisprudence the constitutional right of the people to discuss and argue about pertinent issues of faith (see reference below). 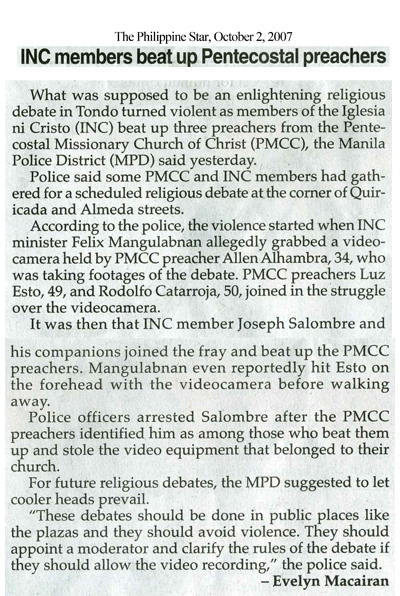 IGLESIA NI CRISTO (INC.), petitioner, vs. THE HONORABLE COURT OF APPEALS, BOARD OF REVIEW FOR MOTION PICTURES AND TELEVISION and HONORABLE HENRIETTA S. MENDEZ, respondents. The respondent Board may disagree with the criticisms of other religions by petitioner but that gives it no excuse to interdict such criticisms, however, unclean they may be. Under our constitutional scheme, it is not the task of the State to favor any religion by protecting it against an attack by another religion. Religious dogmas and beliefs are often at war and to preserve peace among their followers, especially the fanatics, the establishment clause of freedom of religion prohibits the State from leaning towards any religion. Vis-a-vis religious differences, the State enjoys no banquet of options. Neutrality alone is its fixed and immovable stance. In fine, respondent board cannot squelch the speech of petitioner Iglesia ni Cristo simply because it attacks other religions, even if said religion happens to be the most numerous church in our country. In a State where there ought to be no difference between the appearance and the reality of freedom of religion, the remedy against bad theology is better theology. The bedrock of freedom of religion is freedom of thought and it is best served by encouraging the marketplace of dueling ideas. When the luxury of time permits, the marketplace of ideas demands that speech should be met by more speech for it is the spark of opposite speech, the heat of colliding ideas that can fan the embers of truth. Sad to say, we do not anymore enjoy this right as a group.The Movie and Television Review and Classifications Board (MTRCB), under the office of the President of the Philippines and the Kapisan na mga Broadcaster sa Pilipinas (KBP) have prohibited us mentioning or criticizing the wrong teachings and abuses of other religious groups while we are being freely maligned by them in almost every medium of communication. It will be a very fair forum if we can use the internet to discuss matters of faith in biblical fora.To your suggestion, I say Amen!God bless you. The Truth is, God Can Heal Amputees. Next StoryWhat is the True Meaning of Life?